PHI HER (Phi Herculis). From the central "Keystone" of Hercules, which harbors the great globular cluster Messier 13, we look to the south to admire the red supergiant Rasalgethi (Alpha Herculis) and then perhaps toward the northwest along the hero's club, where we can go all the way to fourth magnitude (4.26) Phi Herculis, which lies in the constellation's northwest corner just southwest of Tau Her. 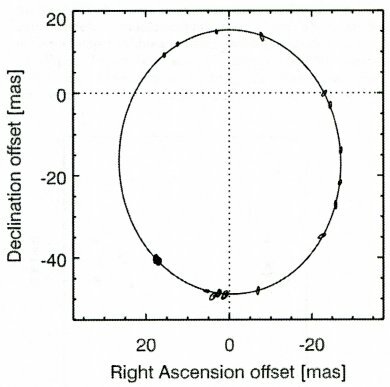 Originally listed as a peculiar class B (B9) star, it's really a close double made of fourth magnitude (4.36) B8 and seventh magnitude (6.93) A8 dwarfs that are typically only 0.032 seconds of arc apart, so close that they can be separated only by interferometry. The distance is open to some question. At the original (modified) Hipparcos value of 227 light years, Phi A (with a temperature of 11,900 Kelvin) shines with the light of 126 Suns, Phi B (from its class around 7700 K) with only 5.1 Suns, the respective radii 2.7 and 1.4 times solar. Theory gives masses of 3.0 and 1.6 Suns, vividly showing how sensitive dwarf-star luminosities are to mass. Near double the mass, and the star becomes two dozen times brighter (aided here by the faster evolutionary brightening of the heavier star). The two orbit each other every 1.547 years with an average separation of 2.23 Astronomical Units (a large eccentricity running them between 1.1 and 3.4 AU apart). Kepler's laws combined with the mass ratio found from spectroscopy then give 3.05 and 1.61 Suns, right on the evolutionary mark. The agreement is considerably better than if the newer Hipparcos distance of 204 light years is used (the measurement probably confused by the duplicity). The A8 dwarf Phi Herculis B orbits its more massive B8 mercury-manganese dwarf companion every 1.55 years at an average separation of 32 milliseconds of arc, which at a distance of 227 light years translates into a mean physical separation of 2.23 Astronomical Units. In reality, the two orbit each other about a common center of mass. From an article by R. T. Zavala et. al in the Astrophysical Journal, vol 655, p. 1046, 2007). Of equal interest is that Phi A is a fine example of a mercury- manganese star (whose leaders are Alpheratz, Alpha Andromedae, and Chi Lupi), with a manganese overabundance relative to hydrogen of 30 and a mercury abundance up by 100,000. Numerous other elements like chromium, zinc, and zirconium are high too, while some, like aluminum, are way down. Severe abundance anomalies are common among A, F, and B stars, the metallic-line stars of class A morphing over into the mercury-manganese stars in class B. The phenomenon is pretty clearly the result of elemental diffusion, wherein some elements sink under the force of stellar gravity, leading to atmospheric underabundances, while others rise upward as a result of stellar radiation. The effect can take place only if the stars are not rotating so fast that induced currents stir things up and bring the abundances back to normal. And sure enough, Phi Her A, with a projected equatorial rotational velocity of 8 kilometers per second (and a rotation period of under 17 days) is the oddball, where as Phi B with its higher 50 km/s speed (period under 1.4 days) is not. There is some evidence of slight ultraviolet variation with a 7.8 day period. If it is somehow related to rotation, then Phi A's spin speed is still only 17 km/s, well under any critical limit to soften the weird abundances. Written by Jim Kaler 6/21/13. Return to STARS.